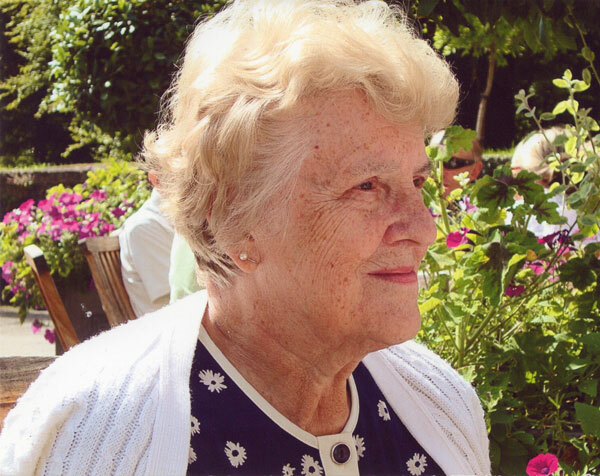 This portrait is of a lady I never met, but her husband has started coming along to my art classes and despite enjoying sketching and painting in watercolours and acrylics, wanted me to this portrait of his lovely wife, Doris, in pastels. Firstly I decided upon a warm grey pastel paper (Canson Mi-Tientes Touch) to match the frame and mount John gave me and cut it to size as the mount has an oval aperture. I sketched the outline of Doris and put in some base colours in white and cream. As the picture is quite detailed I chose to work with Faber-Castell pastel pencils from the outset and continued blocking-in rough areas of colour and tone without blending, This layering technique allows me to put texture into the painting to describe the facets of the face, direction of hair curls and freckles, which then get softened as more layers are applied. John suggested I paint her in a slightly different dress from another photo, which was one of her favourites, and also had a white daisy design and a larger white collar. The design is quite bold so I softened some of the leaves before balancing more of the lights and darks and adding a few more wispy hairs. As you can see from the other photos she looks a little different in each one so I hope I’ve captured her! This is Belle - a very beautiful little pooch, and she seems to know it! Her owners say she's a people-loving dog and very sensitive so I wanted to capture that from the pose. I painted another pet of theirs (Jazy) a few years ago posed on the same chair so I picked the same pastel paper to use again. 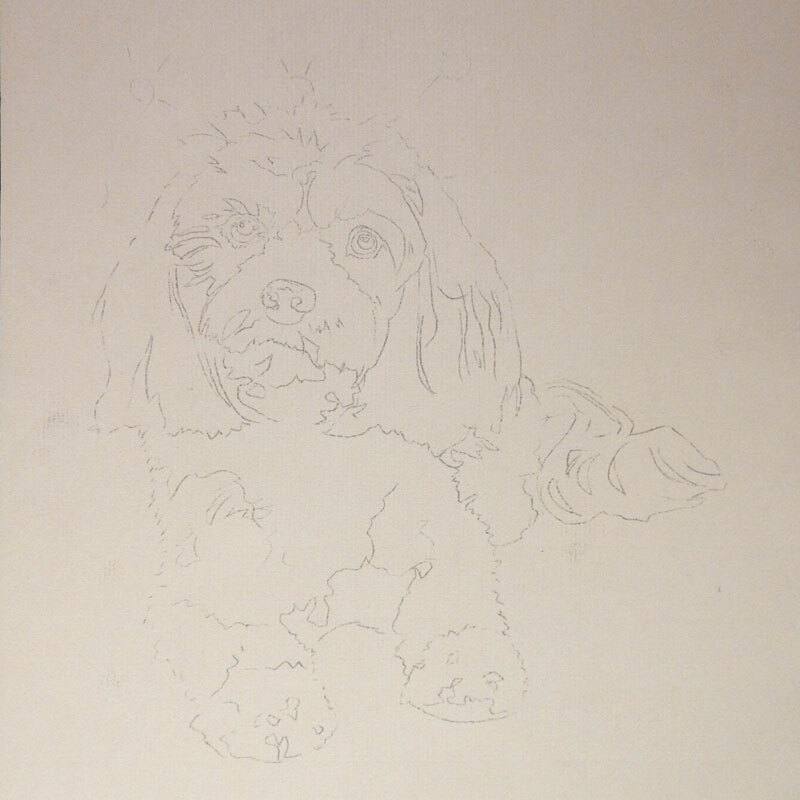 I sketched Belle's outline before blocking in the dark areas with Conte pastels. 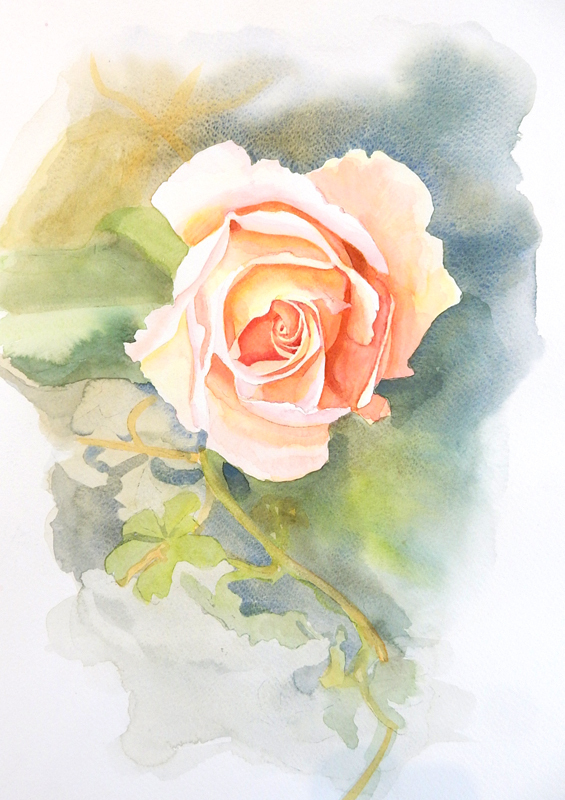 Next I chose the lighter tones to block in followed by the midtones and bright orangey shades. I carefully blended them together to form a base on which to start applying stronger marks and details. These I did initially with the Conte pastels before moving onto using my favourite Faber-Castell Pitt Pastel pencils, blending a little less at each stage in order to retain the freshness of the marks. I used long, sweeping strokes on her ears and squiggly marks on the rest of her coat. Finally I incorporated some of the background buttons to tie it in with the previous portrait. I hope it works!! 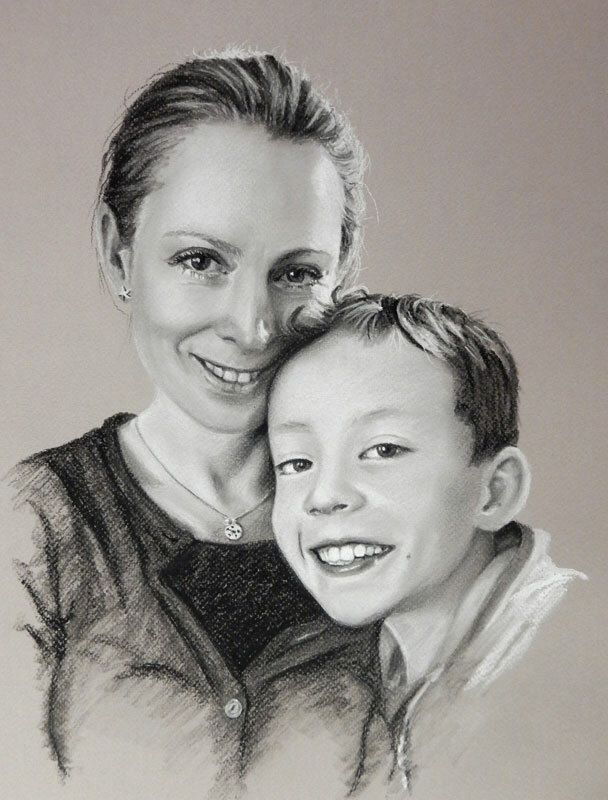 This Christmas commission is a detailed black and white sketch to use as a study for further paintings and shows the progression completed on Murano mid-grey A3 pastel paper. I started by creating some sketches to decide on the crop of the photo then with a few guidelines, started blocking in the white, blending with my finger to lose the texture of the paper and establishing the lightest areas. Next, I used a black Conte stick to map out the dark areas fairly swiftly but accurately. I blended roughly with my finger and overlapped some of the black onto the white to smooth out the skin tones taking care not to smudge the background. The features were added with more accuracy using a black Faber Castell pastel pencil before the whole portrait was carefully blended and adjusted with more white or black pastel to subtly deepen or lighten each area. The difference between the last three stages takes a lot longer than the first few stages - the changes are less dramatic and appear minimal but make a massive amount of difference to the expressions on the finished portrait. 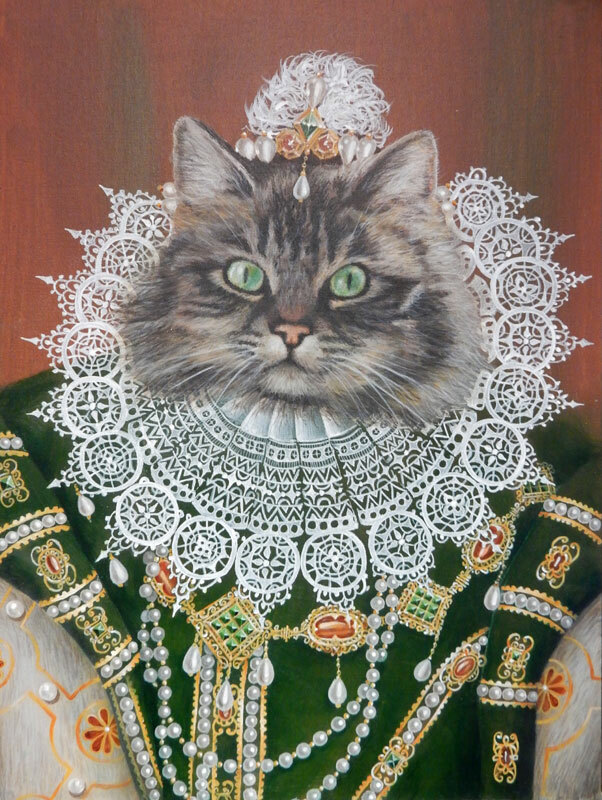 This latest commission is a different take on your traditional cat portrait - the owner wanted 'Lady Lucy' portrayed as Elizabethan aristocracy as befits her pose! I started by making a number of sketches based on a few oil paintings. I painted a fine cotton canvas board with burnt sienna and sap green before making a detailed drawing of the ruff and the rest of the costume. 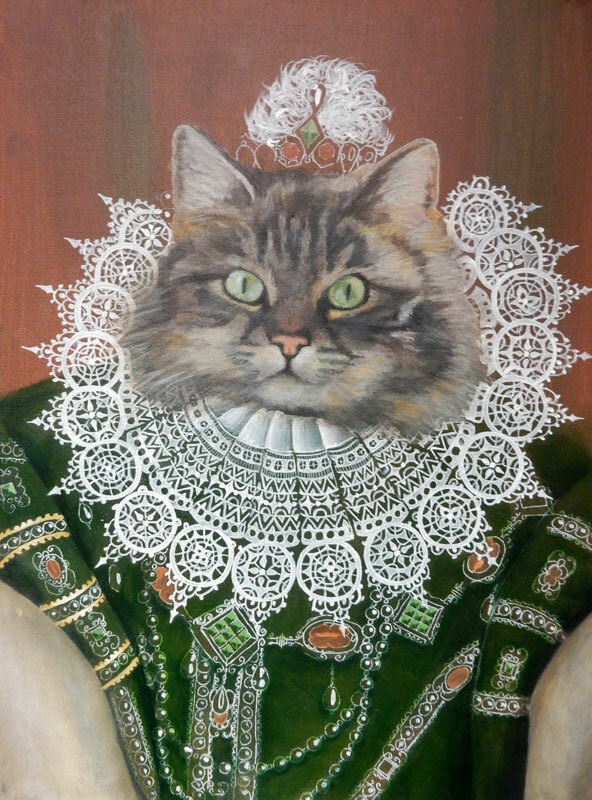 I decided the ruff was the first place to start as that would place the head on the portrait. Once the ruff was filled in I started the underpainting of the cat's face and gradually built up the layers of fur to give a more 3-D effect. The pearls, jewels and gold took hours to paint to get them looking shiny and similar and I've left it all deliberately 'flat' to suit the style of that era of painting. The final touches... flicks of fur, a bit more detailing and those all-important whiskers!! Lady Lucy is ready to be framed and placed over an Elizabethan fireplace in time for Christmas. This latest commission is in pastel and I chose a warm grey Pastelmat paper to sketch the basic outlines to start with. 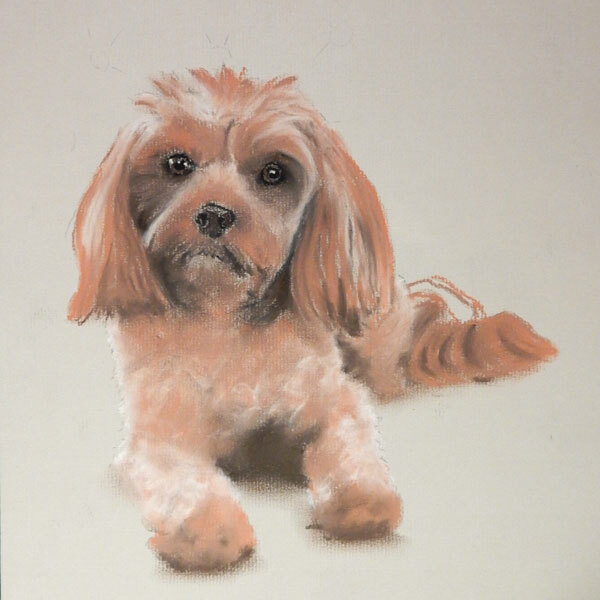 Next I blocked in the background colours and pushed the pastel pigments into the surface to create a 'dry' base before blocking in the dog's colouring with a variety of different pastel sticks ranging from the softer Daler Rowney and Unison ranges to the slightly harder Conte pastels. From there, as the picture is quite small and requires a lot of detail, I started making more defined marks with Pastel Pencils, gradually building up the colours and textures on the dog's coat and blending each layer. 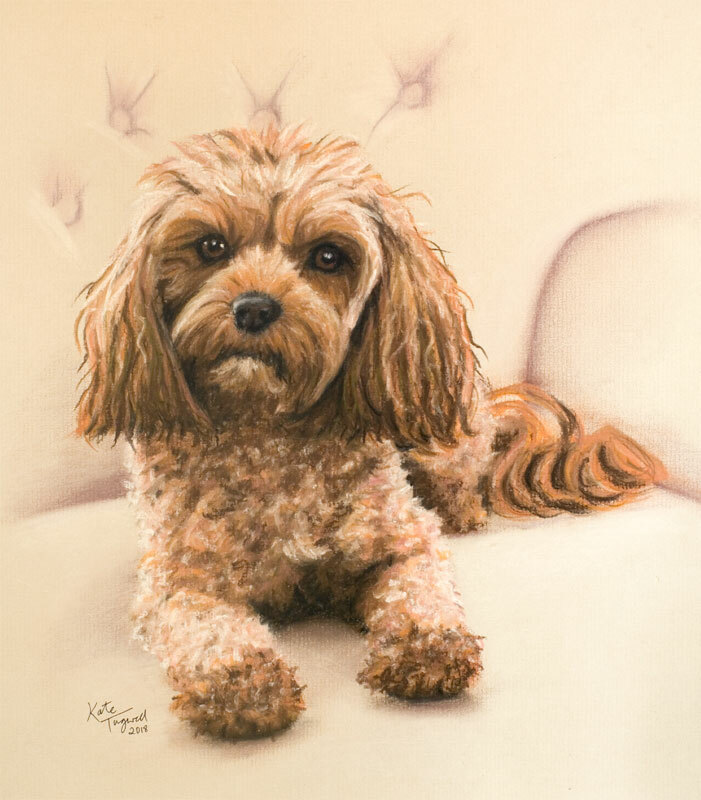 More layers and refinements were gradually made to shadow areas, markings, colours and tonal values, before finishing the background details and using sharpened pencils to add whiskers and fine fur details. Here are some other paintings I have done this year in oils, pastels, acrylics and watercolours. You'll have to guess which though...! This latest commission is of Baggins - a British blue cat with a gorgeous coat and yellow eyes. I started the portrait on a cream Ingres pastel paper and blocked in a base of light grey and white after sketching Baggins in his favourite pose. Then I added a darker blue grey to some of the shadow areas and marked in his eyes and nose with a black pastel pencil. Browns and blues were painted into the coat next and blended with a silicon shaper each time, following the direction of the fur. A warmer brown was added to the ears and some areas of the coat and I put a tiny bit of orange and green into the eyes before carefully blending. 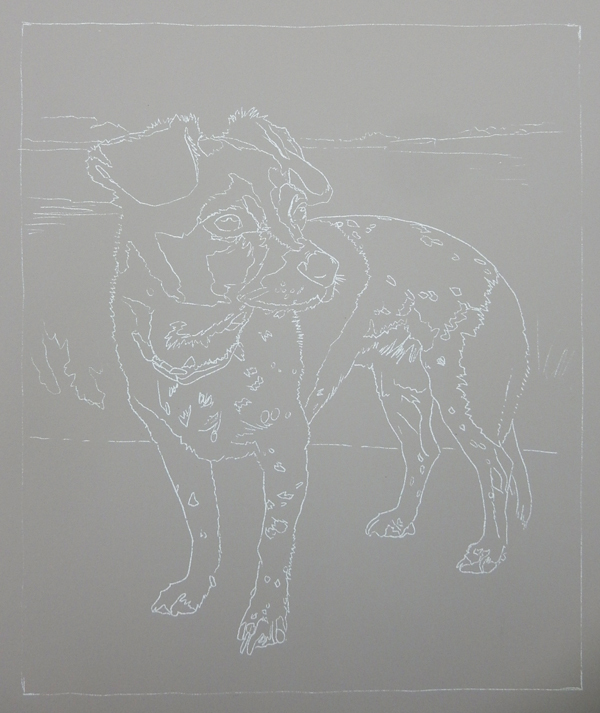 Darker greys were added to create more depth, blending each layer to create a fluffy coat. Lastly grass was painted in with a few daisies to pick out the yellow in his eyes and his name was added at the bottom. There's Baggins! This latest challenge combines four different golden retrievers, taken on different occasions, with different light sources, into one big pastel portrait. To get the composition I scanned in all the photos and rearranged them in different poses and changed some of their heads for their favoured expressions. After narrowing down the arrangements to just a few that really worked, I let the owners choose their preferred composition and set about sketching the basic form onto Fisher 400 Pastel paper. This has a greater degree of tooth than most papers so I chose it because I know I can keep layering up the pastel and covering any mistakes! You can also paint the surface with watercolour or acrylic paint before you start as it only comes in two shades of cream. I decided not to do this to keep the hues quite subtle and I can always add colour into the background later on in the process. Once the dogs were roughly outlined, I marked in the darker shapes and features with a dark brown pencil to 'key-in' the main features. Then I blocked in some mid tones followed by highlights in white Conte pastels. Next I focused on Robbie's face to try to capture his character early on followed by Charlie's, using pencils to get the detail. I have decided not to blend any of the layers on this portrait but to keep the marks fresh and layer them up but I need to work on the dogs as a whole as well as paint them individually. In order to make the dogs look like they belong together, when I use a colour I try to see where I see that colour on the other dogs so peach, yellow ochre, grey, orange, brown grey and even blues were sketched in. Bluebells were a late addition after the grass was painted, to draw them all together and many more layers of colour added to their coats in order to achieve depth. Finally, the dogs were compared together by the owners to adjust the dogs' coats colour and tone... et voila! From large oil paintings to tiny watercolours - this latest commission is equally as challenging as the previous posts as watercolours are notoriously unforgiving and this one required my tiniest brushes! My customer wanted me to paint her latest horse, Bella, in the same size and style of two she had commissioned previously. I love challenges like this as it gives me some parameters to work within and I have to study the work of another painter so I can match their style. Firstly I matched the same make and colour of watercolour paper as I didn't want the surface texture to detract from the painting. I played around with angles and drew Bella with her head tilted up a little so that she would appear a similar size in the frame as the others. Then I painted a thin wash of yellow ochre, followed by burnt sienna and then raw umber with a few darker areas to start picking out the eyes, ears and nostrils. Next I worked a few colours together wet-in-wet and carefully painted the eye. When that was dry I painted a strong wash of burnt sienna around the jawline and added some blue/grey mixes to the nose and shadows. I painted some yellow ochre and carefully lifted out some of the shine on the coat before adding more umbers and burnt sienna with a touch of cadmium red to warm up the muzzle. I just need to check that the colours are deep enough as the photo is very dark and I don't want to darken the painting too much and not be able to lift it back out. This commission will end up in the USA. It's a detailed pen drawing of a medieval hall called 'Hacton Cruck' which is in Herefordshire - you can stay there, it looks fabulous: http://hactoncruck.co.uk/. Following on the back of the Pen & Ink Drawing Day at the Weald & Downland Museum this summer I was commissioned to draw this building as a teaching piece and I've really enjoyed doing it. My family re-discovered my great-grandfather's sketchbooks a few years back and he loved drawing in pen and ink so maybe it's in the genes! 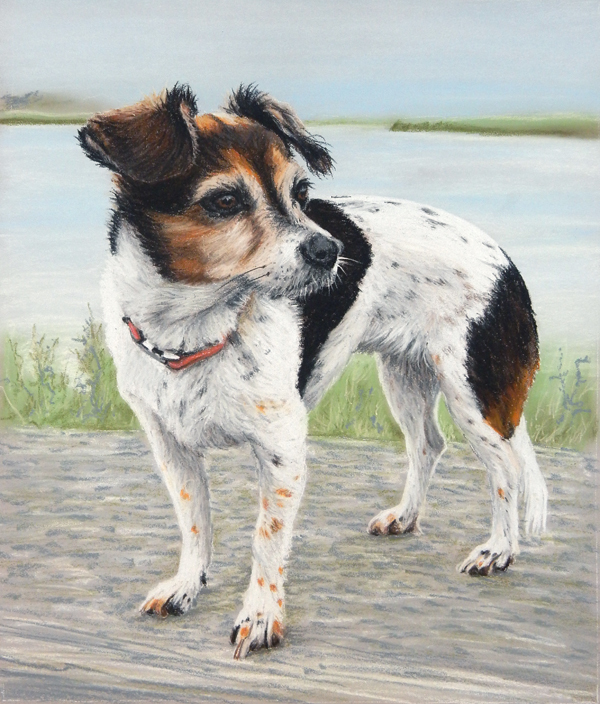 This is a portrait of Shona who sadly died this year. 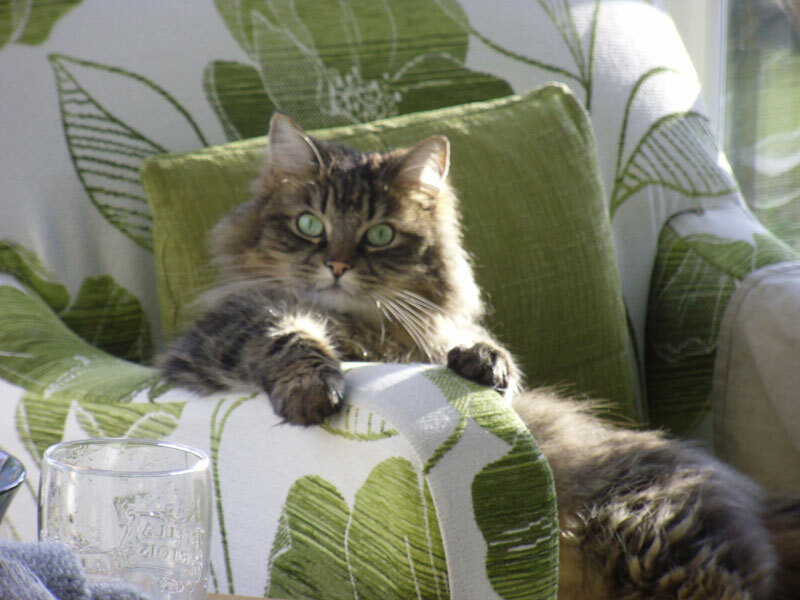 She was the well loved pet of some of our friends in Nottingham so I asked if they'd like a memory of her. I started the portrait at a Pastels Demonstration Day for the South Downs Art Group and finished the portrait in my studio early this summer. I painted the background first on Fisher 400 Pastel Paper, let it dry in the class and then blocked in the shadows and highlights before building up more detail. This paper can take loads of layers, it's not easy to move around unless you want to remove your fingerprints and it eats pastel but I love the effect and depth it can give. This is Annie, the horse, without Charlotte, on a Harris Moore linen fine weave canvas. I started by sketching Annie's head from various angles to work out a pleasing composition before ordering a bespoke canvas. This I primed with gesso and acrylic, adding colour to create a dark background as I decided it would work better to paint oils getting lighter rather than starting from a white canvas. I sketched the horse's head in white and mixed up some greys using Payne's grey, raw umber and Prussian blue for the shadows. The whole head was blocked in and left to dry before building up more layers of glazing. The background was changed to blue at the same time Prussian blue was painted into the shadows to give depth - it acts as a complementary colour to the underpainting. I was planning to change it again but at the moment I quite like the blue. I am working on this at the same time as the portrait of both Annie and Charlotte to allow for drying times, which is quite handy! 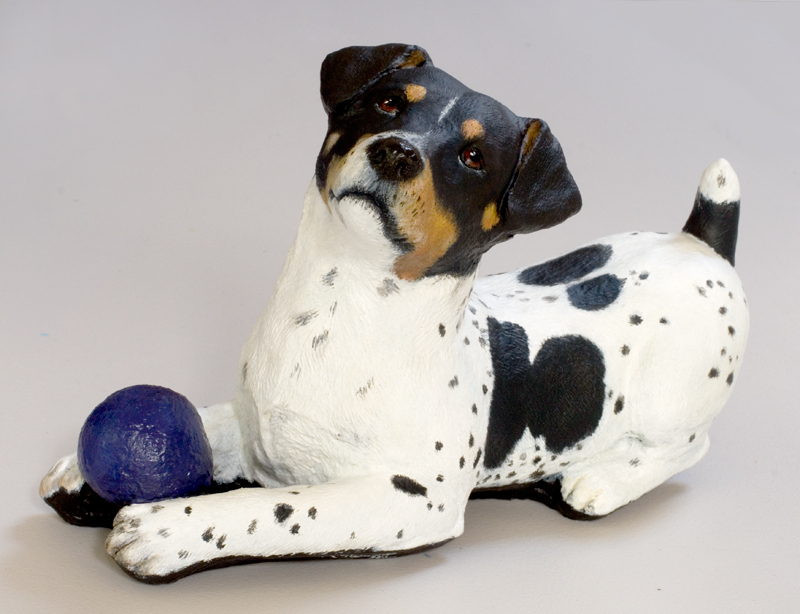 This latest commission is from a customer whose dog I painted years ago. They now want a portrait of their daughter with her horse, and one just of the horse for their daughter. I loved the photo they sent me of Charlotte and Annie so while waiting for the bigger canvas to arrive for the horse I started on the smaller painting which is 9x12" in acrylic. I painted the background a warm black and then drew the information I needed when the surface had dried. Next I started to block in the colours and main areas of light and dark. I chose a fairly small brush to start with as I didn't want to skew the details so the glazes have been built on little by little in order to build up the colour and lose the black - I wanted to make them 'appear' from the darkness. Then I worked more on the horse's head, adding details like freckles (if horses have freckles?!) and started to build glazes on Charlotte's face. I have kept going back and adding different glazes over the last few weeks, as I think I've finished it, and then when I look at it again, I've noticed something else. The last picture shows how I have softened the shadows a tiny fraction and warmed up Charlotte's hair a bit, plus I've changed her mouth shape a little, changed the tones on the horse and added a few more hairs to the horse's nose. Will I still find changes when I look again tomorrow....?!! I've been having fun teaching since my last post and this is the portrait I have been building up for a demonstration in my latest Comprehensive Portrait Course. It shows the process from gridding up, sealing the drawing and creating a grayscale 'grisaille' underpainting before applying glazes of colour in acrylic. This can all be done in just 8 weeks. 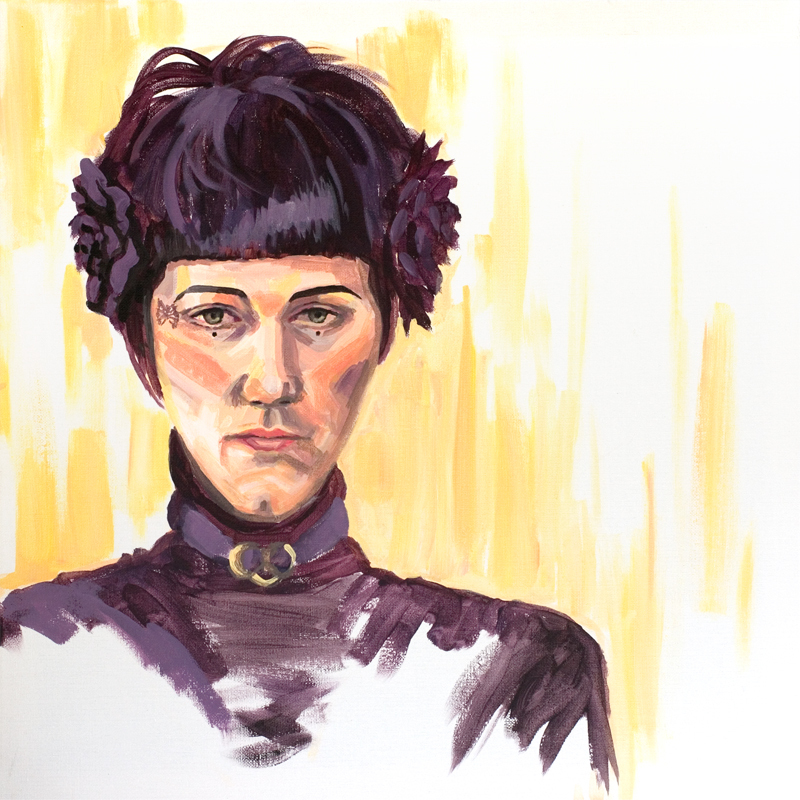 Sign up for the next course if you don't believe me and take a peek at the fabulous portraits painted by those who came on the course - they are amazing!! 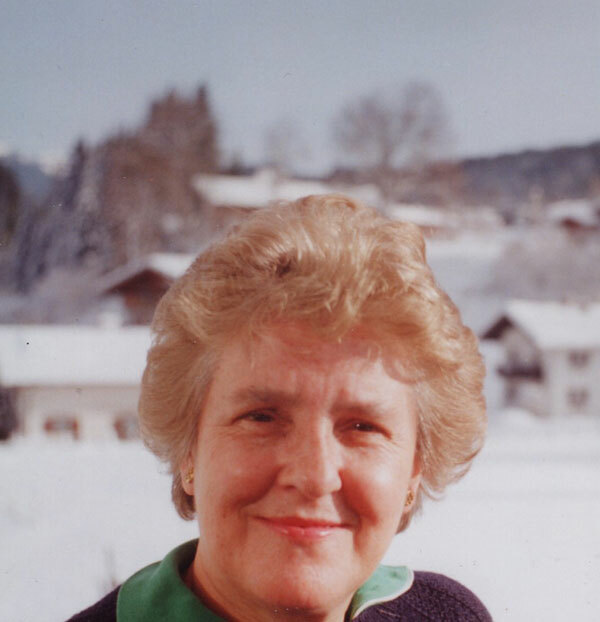 (See the gallery on the Comprehensive Portrait Course page). I love holidays. I never have a bad one because there's always something I can find to do (or perhaps not do). A week in the Lake District in April is asking for the car to be packed with all manner of stuff from sunglasses and sunscreen (ever the optimist) to wet weather, woolly, walking gear and lots to do inside on rainy days. So I packed three large canvases, all my paints, books on art that I haven't yet read, a sketchbook for my rucksack, other books, DVDs and even a 1000 piece jigsaw of a drawing by Leonardo da Vinci. We unpacked at our Patterdale destination in a blizzard and woke up the next morning to a bright, blue, cloudless sky. So we set off walking... and then the next day... and the next day... even the day it forecast rain turned bright and sunny! So at the end of the week I took all my paints and the blank canvases and the unread books, unwatched DVDs and half a finished puzzle back home with me! I did manage a couple of sketches while I was resting my weary limbs though. It was beautiful - the daffs were still out and lambs bounced around in the fields. And yes, that is Helvellyn via Striding Edge with snow on top!!! This 12 x 16" commission amalgamates a number of favourite photos of this cute little dog that races around with his right ear cocked. I started by painting a canvas board with sap green mixed with a bit of white and ochre to give me a mid-tone base to work from. When it was dry I sketched the outline and main features then painted the black and white parts of the eyes, nose and mouth to establish everything in its right place. I put down a base coat of orange, burnt sienna and white to create the shadows and highlights in Belushi's coat then got to work on the background. 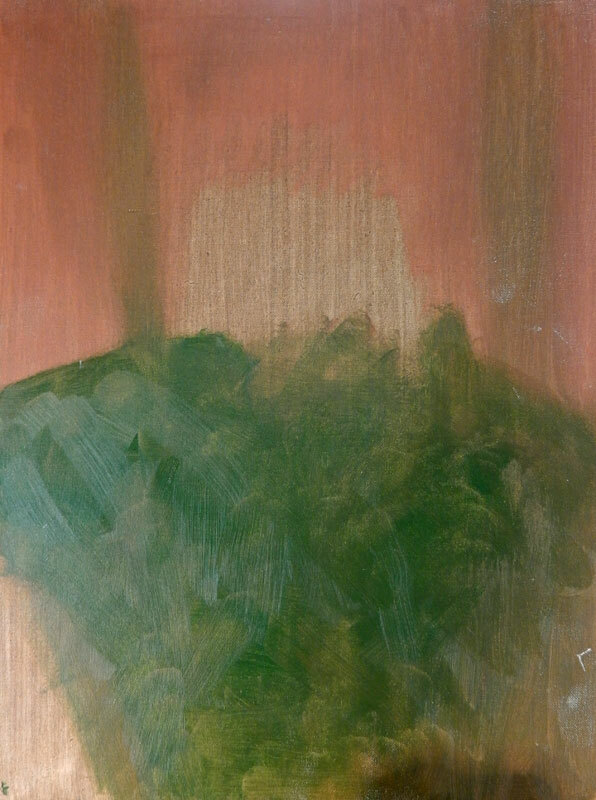 I started by roughly flicking in a variety of greens, browns, yellows and whites with an old bristly hog hair brush. This created texture and shadow areas en masse so I used a fine rigger to add small details of grass, stems and leaves. I sourced a few photos of meadows with daisies, decided on the light source and had fun painting the daisies. I have built up the coat with glazes of colour starting with yellows and browns and working around the spectrum finishing up with the whiskers, and Belushi is ready! One of the commissions I am working on at the beginning of this year is of this lovely dog called Sacha. It has been commissioned for a special birthday and the owner wanted Sacha with the flowering clematis in the background. I chose a dark brown Ingres Pastel paper and sketched the outline which was tricky to see as graphite doesn't show well on this paper. I also wanted Sacha to be looking at the viewer as she wasn't quite in the photo. When I was more certain of the composition I firmed up the outline with a cream pastel pencil. Next I blocked in the main tonal areas, filled in the lighter areas with cream and white and worked it into the paper to give me a base to work from. Then I started to layer up the colours, working and blending each layer and trying not to go over the edges!! I used pastel pencils to draw more of the details and smudged with a blending stick. When the light areas were established I decided to put in the shadows using black and dark brown before moving on to block in the light areas of the flowers and foliage. More layers of increasing detail were applied before finally adding the shadows and strengthening the tonal values. Wishing you a healthy, prosperous and creative 2016! Portrait of Poppy continued & completed! Since the last blog post I have been working on Poppy by painting in lots of glazes and layers of paint to create depth. The background and grass has had a variety of greens painted using various brushes for texture. Poppy's coat has had several layers of lights and darks added to her coat, finally working around the eyes and mouth with a finer brush. Poppy is now framed and ready to send for Christmas! I am not a regular blogger but I intend to put up all sorts of arty stuff over time in the hope that other art enthusiasts get inspired. The primary reason for this blog is for customers who have commissioned a painting to see how their portrait is progressing but there will be other news too. If you would like to commission me to paint your pet, family or friend then please fill out the contact form.